There are many signs that the upcoming collision between comet Shoemaker-Levy 9 and giant planet Jupiter is beginning to catch the imagination of the public. Numerous reports in the various media describe the effects expected during this unique event which according to the latest calculations will start in the evening of July 16 and end in the morning of July 22, 1994. (The times in this Press Release are given in Central European Summer Time (CEST), i.e., Universal Time (UT) + 2 hours. The corresponding local time in Chile is CEST - 6 hours.) Astronomers all over the world are now preparing to observe the associated phenomena with virtually all major telescopes. There will be no less than 12 different investigations at the ESO La Silla observatory during this period. This Press Release updates the information published in ESO PR 02/94 (27 January 1994) and provides details about the special services which will be provided by ESO to the media around this rare astronomical event. 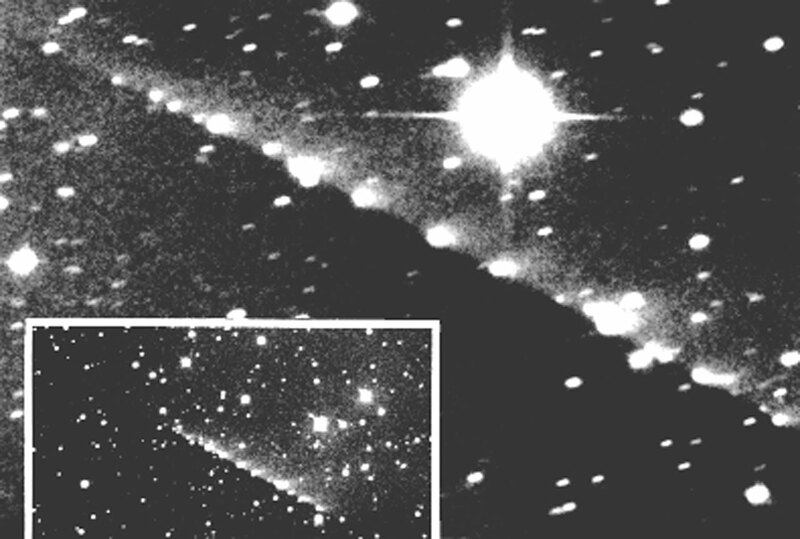 The nucleus of comet Shoemaker-Levy 9 broke into many smaller pieces during a near passage of Jupiter in July 1992. They are now moving in parallel orbits around this planet and recent calculations show with close to 100 % certainty that they will all collide with it, just two months from now. At some time, more than 20 individual nuclei were observed. This Press Release is accompanied by a photo that shows this formation, the famous "string of pearls", as it looked like in early May 1994. Both Jupiter and these nuclei have been extensively observed during the past months. A large, coordinated observing programme at La Silla has been active since early April and the first results have become available. However, while we now possess more accurate information about the comet's motion and the times of impact, there is still great uncertainty about the effects which may actually be observed at the time of the impacts. This is first of all due to the fact that it has not been possible to measure the sizes and masses of the individual cometary nuclei and thereby to estimate the amount of energy which will be liberated at the collisions. The first object (nucleus "A"; indicated on the photo) will hit the Jovian atmosphere somewhat later than earlier predicted; the best estimate is now at about 22:00 CEST in the evening of Saturday, 16 July, 1994. The second ("B") will follow the next morning at about 05:00. These two nuclei are comparatively faint and therefore presumably also rather small, and it is at this moment still uncertain whether these impacts will actually be observed. The first, relatively large nuclei ("E") will hit Jupiter around 17:00 on 17 July. The brightest nucleus ("Q"; actually a double object, as seen on images obtained with the Hubble Space Telescope) is expected to arrive just before 22:00 on 20 July, and the last in the train ("W") should collide with the planet at about 10:20 on 22 July. The timing uncertainty varies from impact to impact; in the best cases, there is at present a 95% chance that the collision will happen between 40 minutes before and 40 minutes after the indicated time. Further positional observations are being obtained, also at ESO, and it is hoped that this margin can be reduced to about +-15 minutes or better. Despite intensive spectroscopic observations, no gas has yet been detected in any of the nuclei. We only see dust around the nuclei which are completely hidden from our view within these clouds. The amount of the dust has been steadily decreasing; this is because the dust production from the individual nuclei -- which began when the parent body broke up at the time of the near-collision with Jupiter in July 1992 -- is slowly diminishing with time. Some of the smaller nuclei have recently disappeared from view, probably because they have ceased to produce dust. It is not clear, however, whether this also implies that they no longer exist at all, or whether they are just too small to be seen with available telescopes. Together with their colleagues all over the world, several groups of astronomers in the ESO member states are now getting ready to observe this event with the La Silla telescopes. The observers at ESO participate in a coordinated programme and will profit from the simultaneous observations with many different telescopes and observing techniques at one site. Altogether, there are 12 individual programmes at all the major telescopes, including the 3.6-m, the NTT, the SEST, the 2.2-m MPI/ESO, the 1.4-m CAT and the Danish 1.54-m telescopes. It is clear that these observations will be difficult, in particular because of the relatively short time that Jupiter and the comet will be well above the horizon at La Silla, at most a few hours each evening. When Jupiter is very low in the sky, the viewing conditions are less favourable, since the light must traverse a longer distance through the turbulent and absorbing terrestrial atmosphere. However, since Jupiter will be south of the celestial equator, observing conditions will be even worse from observatories located in the Northern hemisphere. To record the best possible data (images, spectra, light curves, etc. ), the telescopes must follow the motion of Jupiter very accurately. Due to its orbital motion in the solar system, Jupiter moves rather rapidly in the sky, and the telescope motion must be precisely offset to continuously track the planet without "smearing" the images. This is not a simple task, also since the planet's rate of motion changes with time and new corrections must be made several times each hour. All in all, the observers face a difficult task and must be extremely alert, especially around the predicted moments of impact. This will demand very high concentration and necessitate "training runs" before the real observations begin. Some of these have already taken place -- not surprisingly, various technical problems were uncovered and are now in the process of being resolved. In view of the unique nature of this event and the associated astronomical observations, ESO has decided to provide special services to the media. In particular, it is the intention to ensure that the media will be able to follow the developments at La Silla closely and in near-real time, and at the same time will be kept informed about the observational results at other observatories all over the world. This service will be available from the ESO Headquarters in Garching near Munich, Germany, but special arrangements will also be made for the media in Chile. Kindly note that in view of the complex and critical nature of these observations, it is not possible to arrange direct access to the La Silla observatory during the observing period. ESO will obtain all new information directly from the observers at La Silla via the permanent satellite link to the ESO Headquarters in Garching (Germany). For this, ESO is setting up the necessary internal communication lines at La Silla which will allow this transfer to be done at the shortest possible notice. While the observers cannot be disturbed during the actual observations, they will communicate their results and observational progress at regular intervals, and very quickly, if and when "dramatic" events are observed. ESO furthermore has complete and permanent access to the world-wide communication net between all observers of this event, especially set up for this purpose. The information available from this source will first of all serve to alert the observers about the results in other places and to warn them about new and unexpected developments. Moreover, the Space Telescope European Coordinating Facility, the ESA/ESO group that is responsible for the Hubble Space Telescope use by European astronomers and which is housed at the ESO Headquarters, will contribute with information regarding the observations with this major observational facility. With these important sources of information at its disposal, ESO will therefore be in a prime position to inform about and comment on the latest developments at the shortest possible notice. Background material in the form of text and images, as well as related video clippings (broadcast quality) will be available at request, 7 - 10 days before the first impact takes place on 16 July. Beginning a few days before this date, ESO will issue daily bulletins with the latest predictions and other news, related to the preparations of observations at La Silla and elsewhere in the world. ESO will arrange a Press Conference at the ESO Headquarters in Garching at 20:00 (CEST) on Saturday 16 July, 1994. This will be just before the first impact is expected to happen and will provide an excellent opportunity to inform the media about the very latest developments. Following this in-depth briefing, media representatives are welcome to pass the night at the ESO Headquarters and to follow the first observations at La Silla at distance (food and beverages will be provided). Unexpected and "spectacular" events, should they happen, will be announced and commented as quickly as possible. We will also attempt to contact the La Silla observers by phone immediately after the end of their observations (in the early morning hours at Garching) and request live commentaries about the intial results. At the same time, the latest images will be transferred and made available. There will be a Press Conference each day at 11:00 (CEST) on 17 - 22 July 1994, summarizing the previous night's results. Selected images obtained at ESO the night before will be available on these occasion. Media representatives, who are interested in participating in the Press Conference in the evening of July 16 and who would like to stay at ESO during the following night, are kindly requested to soonest contact Mrs. E. Voelk of the ESO Information Service (Tel. : +4989-32006276; Fax: +4989-3202362), to obtain a personal invitation.